﻿Tofino’s first all-women surf comp kicks off a week of surf celebrations on October 8, 2010 in Tofino! The countdown is on to the O’Neill Cold Water Classic, but the attention the day before it starts will be solely on local female surfers as they take to the water to compete in the area’s first all-female contest, the Queen of the Peak. Organizers Krissy Montgomery of Surf Sister Surf School and Jay Gildenhuys of Shelter Restaurant thought it was time to recognize the women’s surf culture that exists in Tofino with a cash-prize one-day event. Given the sport’s slower evolution in this area, a higher proportion of women are now in the water here as compared to other surfing hot spots. And 50 of them have already signed up to take part in the contest’s longboard and shortboard divisions (or both). Interest is coming from south Island, as well as from the east coast of Canada. The contestants are competing for $2,500 in cash and prizes and the top eight finishers will receive a cash prize. Included in the $35 entry fee is a wine and cheese event the night before the contest at Surf Sister and dinner at Shelter that night (pre-register at Surf Sister, space dependent). The Wickaninnish Inn, O’Neill and Tourism Tofino are co-sponsoring the event. “There are so many top quality female surfers, not only in our area, but throughout North America and I think it is truly fitting that Tofino and our local beaches will be the venue to showcase the talents of these amazing women,” said Wickaninnish Inn managing director Charles McDiarmid. Building on the success of the inaugural event, the organizers are hoping to grow Queen of the Peak into an Association of Surfing Professionals event. The event will be run in a unique way, starting with the reception the night before to orient surfers and give them their first heat times. Babysitting and dogsitting services will be available to surfers on the beach throughout the one-day event, which will run either at North Chesterman Beach or Cox Bay, depending on wave conditions. A multi-course celebration dinner at Shelter will cap off the day. Not only will the day give female surfers a chance to showcase their talent, but it’s also an excuse to hang out at the beach with friends. 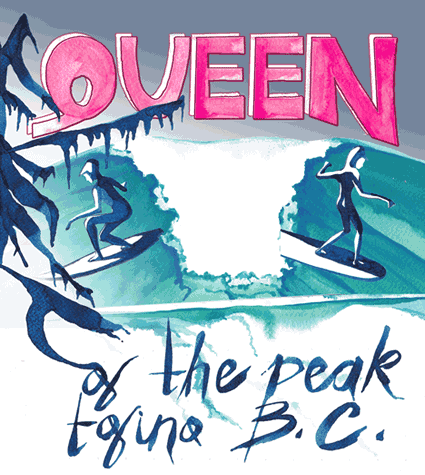 Queen of the Peak - an all-women surfing competition - takes place on October 8, 2010 in Tofino.